The next two Sundays are big ones for the fans of the Game of Thrones. With two important weddings on the horizon - Joffrey's and Rob's Uncle's - there could be an awful lot to cover in a short period of time. I'm hoping we see both weddings this season, but I have a feeling that they'll give us the Uncle's wedding in the finale, and keep Joffery's for the beginning of season four. 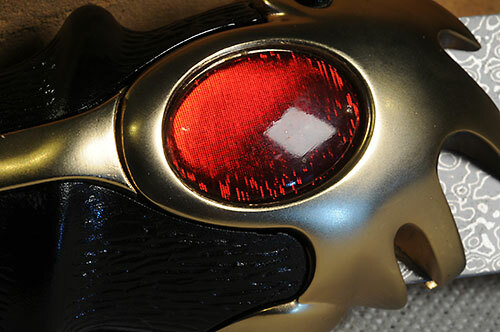 In any case, fans have lamented the lack of collectibles based on the show for some time. Valyrian Steel began doing weapons awhile back, but these weapons were based on the descriptions from the books, not the appearance on the show. John Snow's sword was actually used on The Big Bang Theory, and has hung on their wall ever since. I always thought they missed a golden opportunity to discuss the difference between the nerds that would go for a book based replica, and those of us cool kids who would only buy something based on the show. Thankfully, Valyrian Steel is now making HBO replicas, based on the actual appearance on the series. 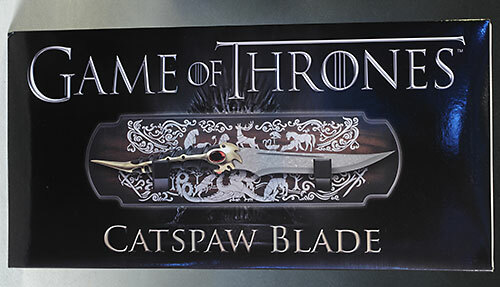 I picked up the Catspaw Blade, the weapon used in the attempt on Bran's life, and later blamed on Tyrion. This replica is a limited edition of 2500, and will cost about $270. It's a pretty basic Styrofoam box with a slip cover. Everything is safe, but it's quite simple. There is a nice COA though, at a large 8 1/2" by 11" size. 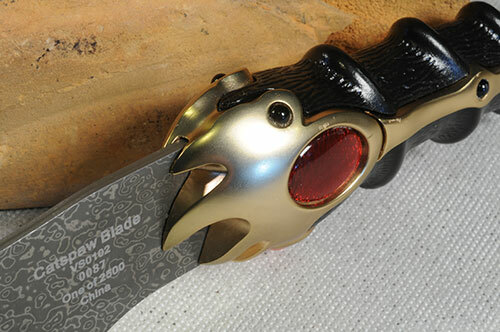 The limited number is included on the COA of course, and it's also printed on the back side of the blade. From a review of several of the scenes from the show, it looks like they've done an excellent job capturing the look of the knife. It's harder to tell from stills, but I'm giving them full credit on matching the actual prop. The knife is very large, coming in at almost 20" long. It has some nice heft too, since most of the weapon is metal. The hilt is gorgeous, and with design of the brass colored metal wrapping around the blade, you can see where it got its name. 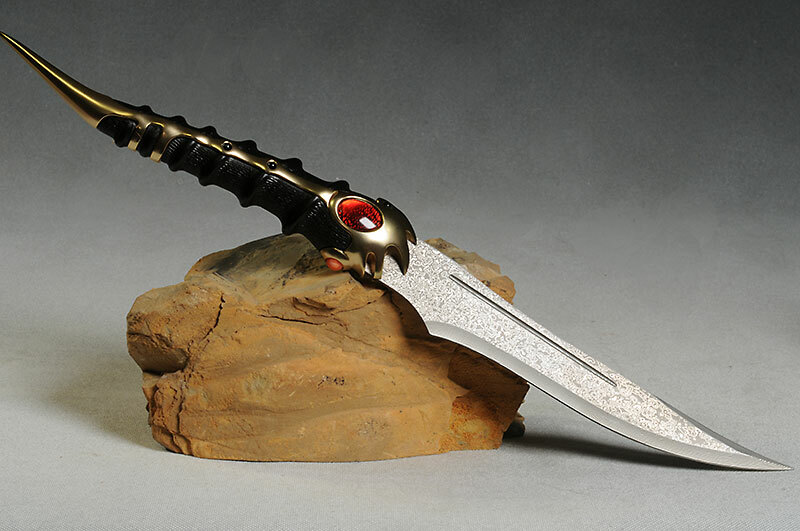 There's a beautiful red 'jewel' in the hilt, as well as a smaller faux gemstone on the underside, and two dark stones on the top, almost like eyes. These dark stones are repeated on both sides as well. The construction is top notch, and the you can feel the quality of the materials and construction when you hold it in your hand. This is not a sharpened weapon, although the tip could easily pierce skin. 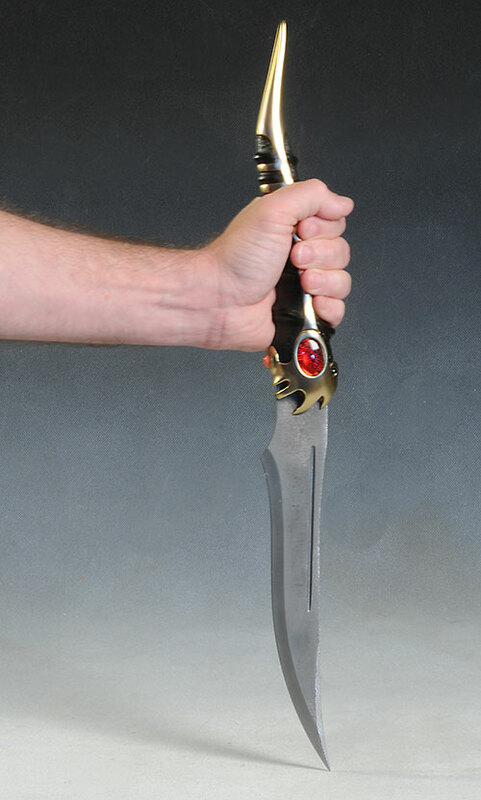 If you are looking to assassinate the son of a Northern Lord, I'd suggest looking elsewhere, but for big fans of the show, this blade will do just fine. 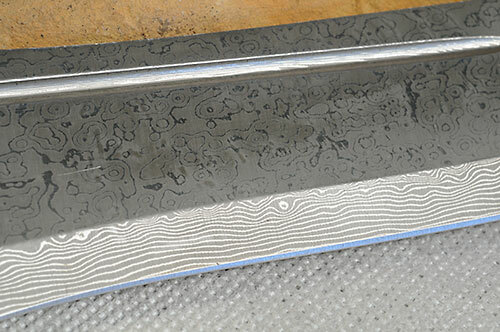 Paint isn't exactly the right word here, since it's really about the patterns and finishes on the metal surfaces. The brass and black hilt is gorgeous, and really makes this weapon pop. 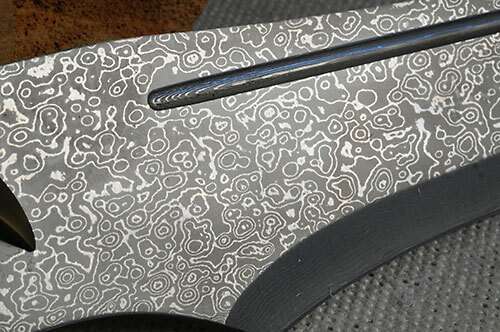 As those who have read the books know, Valyrian steel is precious, and has a wavy, layered pattern that distinguishes it from a regular sword or knife. They've mimicked that here, both along the side of the steel as well as the angled edge. It looks reasonable, but a bit over the top for my tastes. There's sort of an accessory here - the wooden display that can be attached to a wall. Weapons usually come with one, but this is one of the nicer ones I've seen. The two wooden supports hold the blade tightly, with no chance for it to drop out easily or wobble around. The plaque is decorated with two very interesting animal scenes. Across the bottom we see the three headed dragon being attacked by the lion, the wolf and the stag. Across the top, the stag stands proudly in the center, with the other animals paying their respects. It's a nice display plaque, with a very story-centric theme. It hangs on the wall easily, and is a great way to show off the blade. This is not a cheap replica at almost $300. Considering the edition size, it seems a bit too high to me, although with the popularity of the show, I doubt they'll have too much trouble selling them through. As much as I love the books, I have no interest in replicas based on an interpretation, even if those replicas are blessed by GRRM. Until they did something from the show, I wasn't biting. 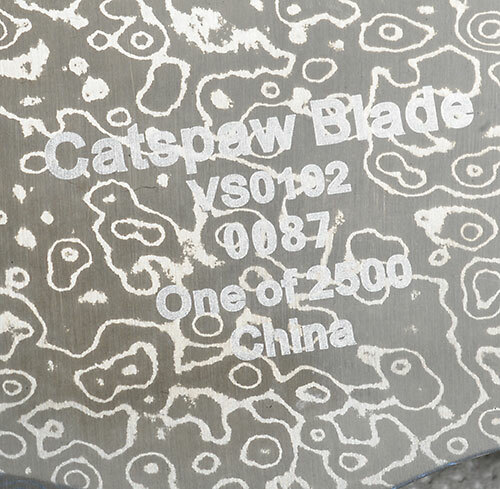 But once I saw the Catspaw Blade, I couldn't resist. It's a bit too expensive for what you're getting, but that's probably a minor nit for fans starved for quality collectibles. They are also doing the Hound's helmet, and I suspect I won't be able to resist too much longer...now bring on the royal weddings! 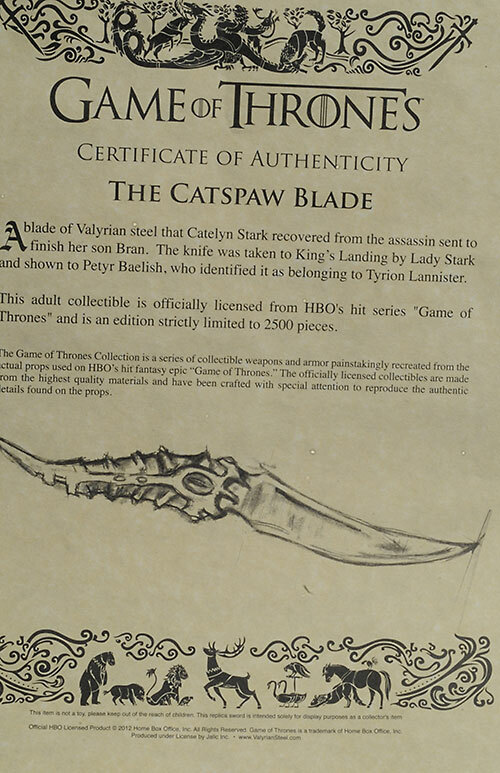 You can get this directly from Valyrian Steel for $270, or you can search ebay for a deal. I've checked out a couple other Game of Thrones items, including the Hand of the King pin and the Daenerys bust.